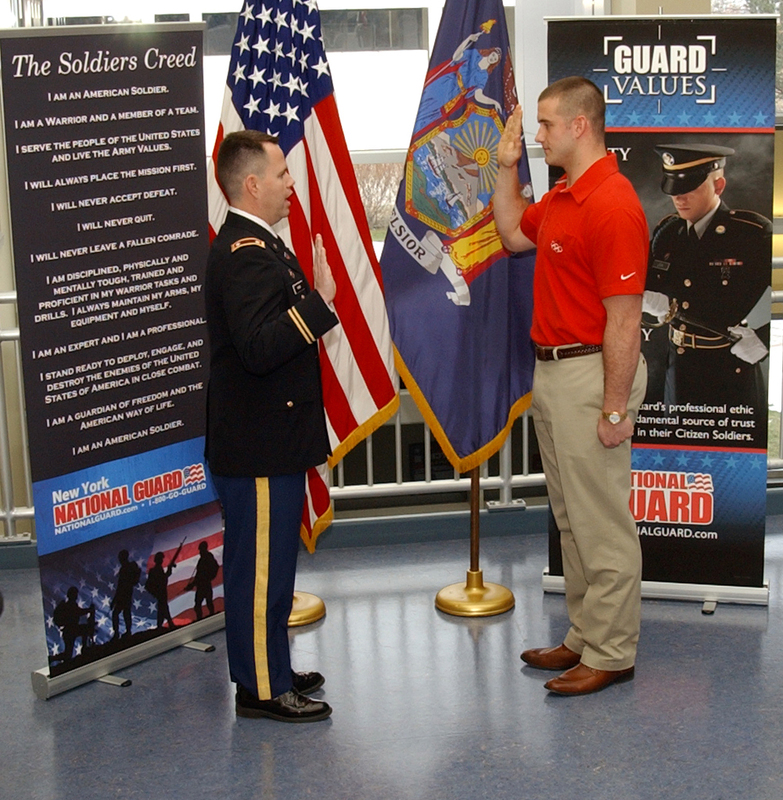 The New York National Guard’s newest soldier is bringing a bit of gold to the Army. Olympic gold medalist Justin Olsen enlisted during a ceremony Jan. 9 – and then flew to Europe to resume the World Cup bobsled season. Olsen, a private first class, will train as a human resources specialist. He also plans to apply for the Army World Class Athlete Program, which allows soldiers to juggle their military commitment with training and competitions. Olsen won gold as part of the four-man bobsled team at the 2010 Vancouver Olympics, the first top finish for Americans in that event since 1948. His enlistment follows the path of other Olympic bobsledders. One of Olsen’s teammates, Steven Holcomb, is a former Utah National Guardsman. John Napier deployed to Afghanistan with the Vermont National Guard after driving the U.S.’ other sled during the Olympics. Another Guardsman, Lt. John Fogt, competed as a breakman on Napier’s sled. Olsen first learned of the program from teammate Mike Kohn, who serves as an infantryman in the Virginia National Guard.